Under Defeat HD: Deluxe Edition has been released on Amazon and on the Playstation Network, courtesy of Rising Star Games. In this game, players take control of a pilot in the final days of the war between the Union and Empire. If you played Sine Mora on a PS3 or Vita, one of the pilots in this game will look familiar...and so will their subweapon. Enough of that, let's get to the review! I like the graphics in Under Defeat. There's good detail in the background and no jagged lines. Animations are fluid. Smoke and explosion effects are nicely rendered. There is slowdown, however, which can be helpful and annoying. Sometimes the smoke can cover enemies, making tightly packed groups a bit more dangerous than they should be. One part in particular I like is when the second boss is defeated. The boat explodes, splits in half and starts to sink. As it begins to submerge, water comes down from the sky, launched up by the previous explosion. It's just a cool detail that I really like. While the graphics are good, they aren't super AAA-title great. That's fine for me, since as long as it looks good enough and plays great, I'm happy. As with most shooters, the music is just kind of there. It's fitting, but only one piece sticks out for me. The music for level 1-5 "Graveyard" starts pretty melodramatic and then quickly ramps up. I'd advise turning down the sound effects if you want to hear the music since they can drown it out pretty quick. The controls mostly follow the standard of one button = shoot and the other = bomb. If you refrain from shooting for a few seconds, a meter fills and when you next fire, an "option" will appear and help for a few seconds (if not destroyed). As far as I can tell, the power-ups that can be picked up only affect the option (except for the chopper with no option). The option helps, but doesn't really stick around long enough to be much help. When the option is needed most, it's hard to avoid shooting long enough. Since the firing line of the helicopter is so narrow, you can change your angle of fire. If you move to the side while not firing, the helicopter will turn and firing will lock at that angle. If you ever played the jeep in the SNES game Firepower 2000, it is similar to that. This allows the player to shoot a bit to either side, but it is far better and easier to turn on right stick firing. Try it out, and you won't go back to the default method. Looking at the trophy list, you can see that there are 10 levels. This might not seem like a lot, but each stage is longer than you might think and with the default two continues, can take awhile to get through them all. As with most plane shooters, replaying is key to learn the stages, get better and raise your score. I'm still having fun going through the stages and improving. Don't get killed staring at the pretty explosions. There's two modes: New Order and Arcade. Arcade has a smaller screen, but the bullets are slower and the game is a little easier (to me). New Order is basically made to fill the screen, but it's not stretched-looking or anything bad like that. It's just slightly changed so it is the aspect ratio as a television and not an arcade cabinet. There is an option to have the screen displayed on the side, so you can mimic an arcade cabinet if you can somehow rotate your TV. Going through both modes obviously doubles the amount of stages, although there isn't much difference. In addition, there are four playable helicopters to try out. One of them gets no option, but the power-ups effect its shot, which is neat. The physical release is an Amazon exclusive, and includes the game, soundtrack CD and digital artbook. It is $30. The digital release is the game by itself. It is also $30. Unless you really want the digital, I'd recommend the physical, since they cost the same and you get the nice extra stuff. Being a retail game, there is a platinum to gain here. Most will be blatantly obvious how to get them, but a few of the score ones are really vague (hint: keep your bombs for these). There's a few for beating the game on hard difficulty. This isn't quite as bad as it sounds, since playing will unlock more continues and you will get better at the game, to boot. Playing long enough will unlock free play, making hard mode a lot easier. Continuing will still send you back a bit, so you can't just smash your way through. You will still need to learn to beat the bosses within 3 lives to advance, so free play isn't a free pass to beating the game. There's also 2 player if you have a buddy that wants to help out. 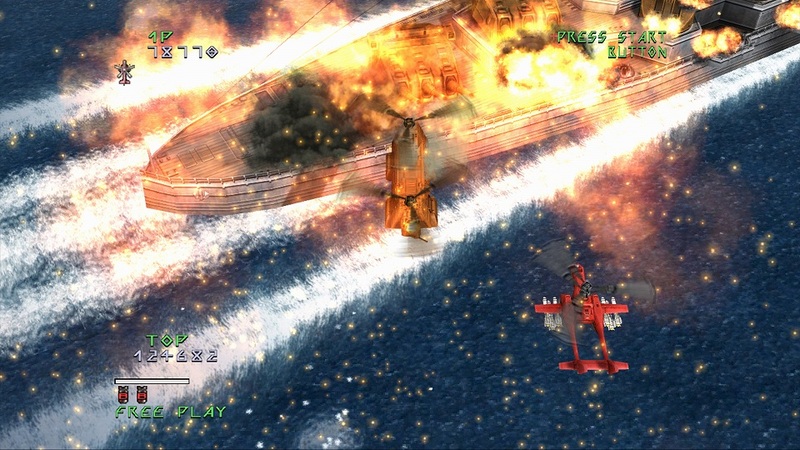 If you're a fan of plane shooters (shmups), you will like Under Defeat HD: Deluxe Edition. It's definitely my type of game, and a worthy addition to any shooter collection. It's not a constant bullet hell billion points game, but it doesn't need to be. The game isn't groundbreaking, but it's fun, and that's what counts. End of the Year Xbox Sale Time!